the 2012 Merrow Product Catalog has shipped! 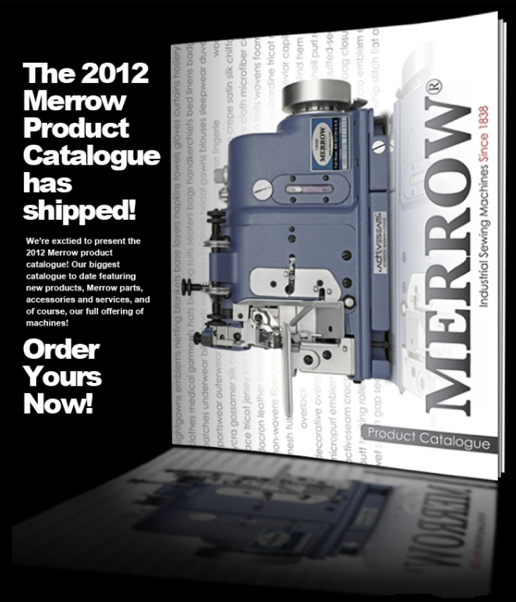 - Merrow Sewing Machine Co.
the 2012 Merrow Product Catalog has shipped! After several months of work, it is my pleasure to present the 2012 series of Merrow catalogues and brochures, describing in detail the value and application of Merrow products. This year we have created several types of material to help educate our customers about the wide variety of products offered. At Merrow we work hard to support our agents and customers, and this latest release of marketing material is one of many major initiatives planned in 2012 to increase the awareness of Merrow in the market place. Everything available in this packet is also available online; in fact the website www.merrow.com contains a wealth of information and detail about all of these products and much much more. We hope that Merrow will remain an important part of your business in 2012, and I expect that should you need any specific information about our products, you will contact me directly; I look forward to hearing from you soon. Please send our shop one. We love your machines.